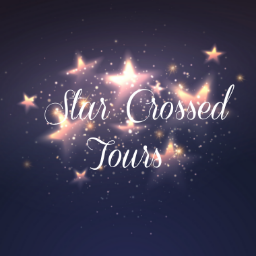 Today I don't only have a review for you but there is also a chance to win a paperback copy of the book- be quick though, the flash giveaway ends in 24hours! You’ve seen Mark Darcy in the reindeer jumper his mother gave him, now meet Marco Cavelli in this season’s hottest Christmas knit! Until walking the snowy streets of Oxford, Marco Cavelli quite literally crashes into her life – and, complete with broken leg, becomes her unexpected house-guest. All dreamy brown eyes and 6’5” of gorgeousness, the man is hotter and more delicious than a freshly baked mince pie. The thing that first caught my eye with this book was the adorable cover and catchy title - it had me instantly intrigued and I started reading even before looking at the blurb. It wasn't far in to the book, when I clocked the Cavelli name - Rob Cavelli was the hunk in last year's Christmas novel from Debbie Johnson, Cold Feet At Christmas; A book that I have sat on my kindle and a book that I was sure I still had to read... As this book's story unfolded and it touched lightly on Cold Feet At Christmas bits and pieces were forming in my head confirming that I had already read it. 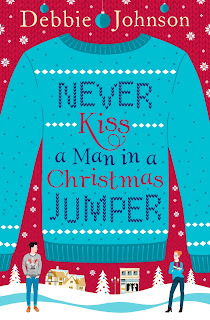 I quickly abandoned Never Kiss A Man In A Christmas Jumper and hopped back to read Cold Feet At Christmas and write a review of which you can read here. I loved this book. It was gloriously romantic and set at Christmas time which if you are a sucker for the both like I am, then it equates to a pretty perfect story. Maggie first comes across Marco Cavelli during a run with her daughter, Ellen, where he is at the park with his nephew Luca and s being drooled over by the other mothers! Their second encounter. albeit their first with communication, comes when Marco is looking for a suit to be tailored and walks into Maggie's Shop where she is a Bridal Gown designer and maker. Not expecting to bump into Marco again, Maggie quite literally does that when they collide on slippery road surfaces and both crash off their bikes. Marco comes off worse than Maggie but they both end up at the local hospital. It is here that Maggie starts chatting to Marco's brother and Sister in law, Rob and Leah from Cold Feet at Christmas, and i have to admit it was nice to see how their lives have continued from that book. Maggie and Leah appear to form a quick and strong friendship which over the course of the next chapter or so, results in Maggie somehow agreeing to Leah and Rob's request of having Marco live with her to recoup! As the story unfolds, it is clear that both Maggie and Marco are falling for each other, yet Maggie is scared of unknown territory - she's only ever been with one man before, and that was a one night stand when she was a teenager resulting in her becoming a single mother to Ellen. Never Kiss A Man In A Christmas Jumper is a delightful read about feelings and facing your fears, Maggie is convinced it wont work with Marco as she can no longer have children, something she has blocked from anyone for years. 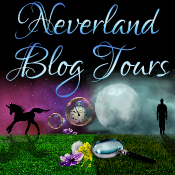 The book was a quick read, with a fast pacing story. The epilogue was a joy to read and wrapped up the book nicely. Although Never Kiss A Man In A Christmas Jumper can be read as a stand alone book, at points Rob and Leah's story is covered, I would recommend reading Cold Feet At Christmas first if you are planning too as it might be a little weird reading how they got together after already being together in Marco and Maggie's story. Maggie was a great, caring character but I loved Ellen and her short one liners - she was a little breath of fresh air in amongst the love and romance.... and of course Marco is just what you need at this time of year - tall, dark, handsome! 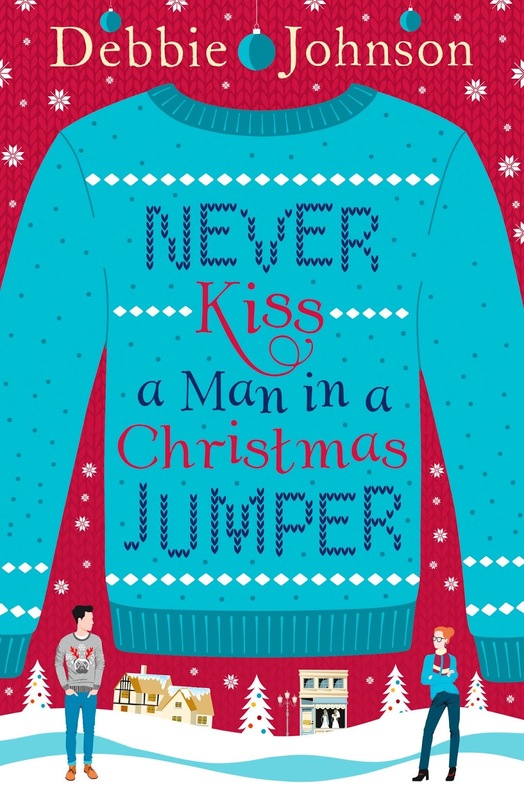 I have reviewed Never Kiss A Man In A Christmas Jumper as part of the HarperCollins #HarperXmas event - for more reviews, posts and giveaways please search the hashtag! I would like to thank the publishers and NetGalley for my review copy, this has been my honest opinion. Can never have enough Snow! It wasn't a Christmas jumper at all until I bought glittery paper and started wrapping gifts yesterday. Now I have a glittery Christmas jumper, jeans, hair, spare room, sticky tape, scissors and pen! I love romantic Christmas novels. Sounds great! This was a fab romantic festive one, as was Cold Feet by the same author! Have never got round to buying one! I think about it every year and then convince myself I'd never wear it.